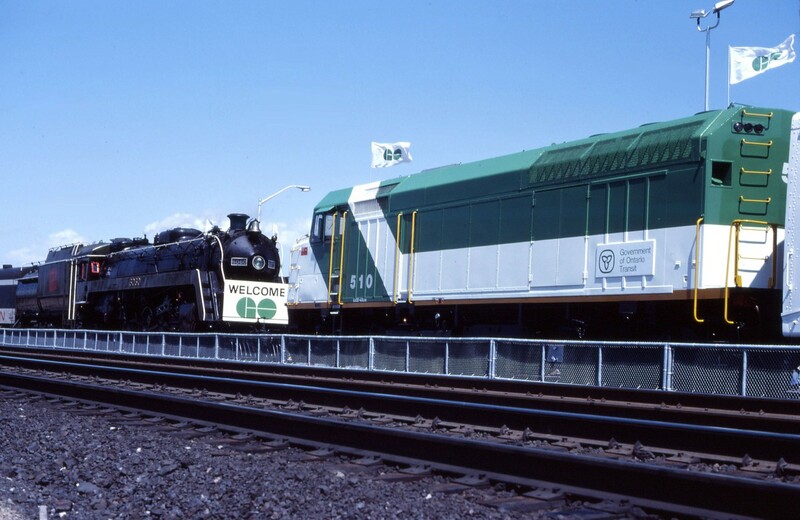 Railpictures.ca - Doug Page Photo: For the start of GO service to Richmond Hill forty years ago, CN and GO ran special trains–personally, I like the CN one better! | Railpictures.ca – Canadian Railway Photography – photographie ferroviaire Canadienne. Caption: For the start of GO service to Richmond Hill forty years ago, CN and GO ran special trains--personally, I like the CN one better! …and free rides on GO’s ‘dime’ up and down the Bala Sub from Union…rode behind 6060 (conventional 5200 and 5300 coaches ( may be from the conventional CN Barrie commuter train? )) up the Bala (Don River Valley hill) – really nice to hear that stack talk – to R Hill and down on the new double deck GO coaches ( 2000 series)….those six new ( in 1978) F40PH’s were a huge mistake with prime mover at full throttle all the time to provide HEP juice to the coaches!